Chester NH is a beautiful small town in southern NH where the community makes a difference. 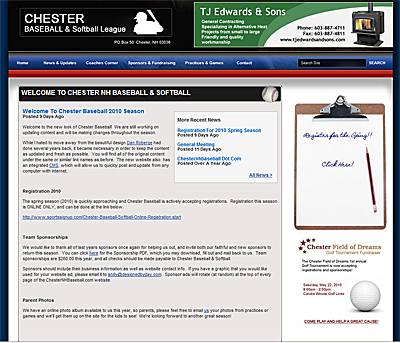 Though small, the town of Chester has several sports teams, including an entire baseball league that plays with other local small towns. Designed By Day provided a brand new website in spring 2010, integrating the latest designed by day content management system, giving the organization a quick and powerful website to help keep parents informed.